Friction is a liability in a sawmill. Not only can it cause excess wear and tear on equipment leading to increased down time, but it can also lead to sparks and breakage, which in a mill, can be deadly. While most mills have converted to lower friction chain beds like those made of urethane, they can't match the durability and self lubrication of nylon in today's high-speed environments. Nylatech offers a variety of solutions ideal for sawmills. 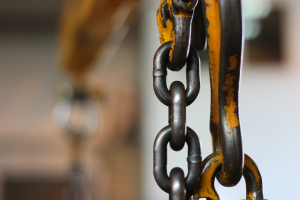 Less lubrication means chains run smoother, longer and in the current market, that kind of efficiency is imperative. In addition to needing less lubrication, nylon is the ideal solution for mills because of it's rigid properties, ability to be colored for safety, resistance to temperature fluctuations and its ability to withstand extreme force. Reduce the friction in your mill. When it's time to replace the chain bed, bearings, pulleys, blocks and other equipment, contact us to learn about the solutions best suited for your operation.